I set out to investigate whether the correlation would hold up at a much broader geographic scale. 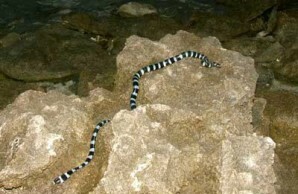 Sure enough, data in the scientific literature indicate that the distribution of sea kraits generally coincides with areas having low-salinity surface waters in the tropical Indian and western Pacific oceans. Indeed, using data from South Asia for the known distributions of all sea snake species combined, I discovered that in general, more sea snake species live in areas of greater precipitation. The distribution of Laticauda species among small islands is also quite patchy, so one might hypothesize a dynamic model in which populations persist in certain areas that receive adequate precipitation and either die out or emigrate from others during droughts. 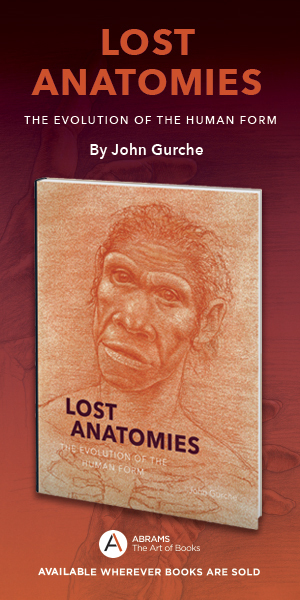 Dispersing individuals might later repopulate the abandoned sites when the climate turned favorable once more. 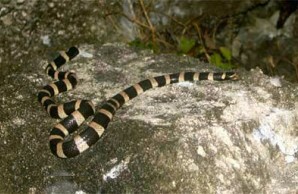 There are, of course, other factors that determine sea snake distributions—temperature and prey abundance, for example. But to the extent that evolving populations have a physiological requirement for freshwater, they are more likely to survive in regions of high compared with low precipitation. Moreover, the changing availability of freshwater potentially influences the dynamics of coral reef communities, because sea snakes can be important top predators there. The irregularity and unpredictability of rainfall patterns is likely to limit the distribution of at least some marine snake populations. 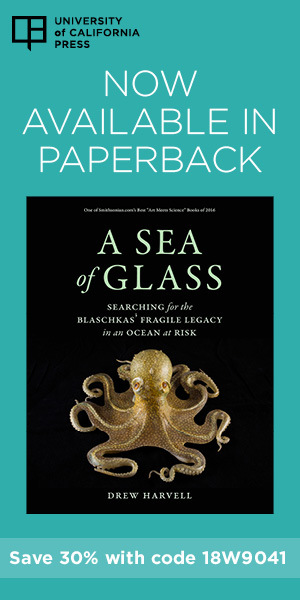 It might even explain, in whole or in part, certain declines and local extinctions that have recently been documented. Precipitation has generally decreased over the tropics since the 1970s, and climate models predict it will decrease further in tropical regions with seasonal drought. Because at least some sea snakes are dependent on freshwater, we may expect to see corresponding changes in their populations. But little file snakes and the two sea snake subfamilies of the Elapidae (the Hydrophiinae and the Laticaudinae) are not the only snakes that live in saltwater. A few members of two other snake lineages, both in the family Colubridae, inhabit the brackish waters of salt marshes and estuaries. William Dunson has shown that those species probably also depend on freshwater. Thus, species representing four out of five distinct lineages of snakes that inhabit saltwater are now known to require freshwater to maintain normal water balance. The fifth, the Hydrophiinae, has not yet been thoroughly studied in that context. 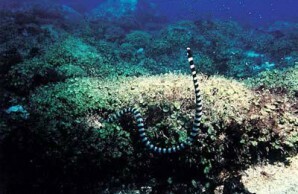 Although hydrophiines are the snakes most completely adapted to life in the sea, it does seem likely that they, too, need the sweet stuff: Dunson has observed that some hydrophiine sea snakes undergo a net loss of body water in seawater, and the pelagic species P. platurus not only will drink freshwater in the lab, but also reportedly dehydrates when fasting in seawater. My team and I are planning studies of representative hydrophiine sea snakes to settle the matter. Understanding the water requirements of all sea snakes could prove to be crucial to their conservation. Some researchers have suggested that they may turn out to be indicator species for the health of coral reefs, which are in deep ecological crisis. Sea snakes’ thirst also raises the question of whether other marine reptiles, such as sea turtles, might turn out to be more dependent on freshwater than we’ve presumed.